It will require surgery within the next two weeks..
…….sigh……… Now begins the long road to recovery. Peter – was a great guy and will be missed. 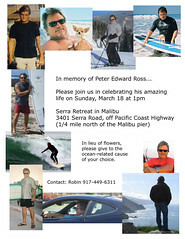 Tomorrow is the paddle out in Malibu in his memory. In March Brennen was awarded Student of the month award. What a great guy. Brennen did not get this award the traditional way of just being smart. He got this by putting in the hours and working hard. Mrs Moss recomended Brennen for this award. This entry was posted in Brennen, family.